Most netbooks ship with 1Gb of Ram, and many older netbooks shipped with even less. Even if you want to add more ram, often they can only be upgraded to a max of 2GB. 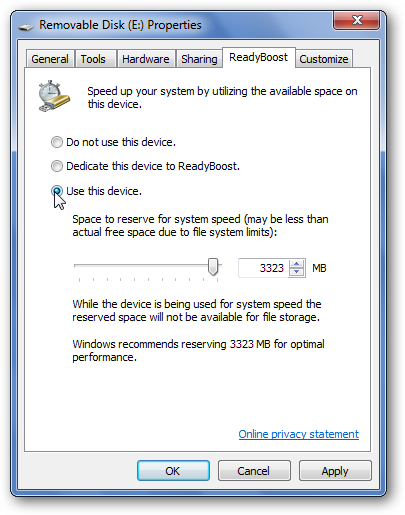 With ReadyBoost in Windows 7, it’s easy to boost your system’s performance with flash memory. If your netbook has an SD card slot, you can insert a memory card into it and just leave it there to always boost your netbook’s memory; otherwise, you can use a standard USB flash drive the same way. Also, you can use ReadyBoost on any desktop or laptop; ones with limited memory will see the most performance increase from using it. Please Note: ReadyBoost requires at least 256Mb of free space on your flash drive, and also requires minimum read/write speeds. Most modern memory cards or flash drives meet these requirements, but be aware that an old card may not work with it. Insert an SD card into your card reader, or connect a USB flash drive to a USB port on your computer. Windows will automatically see if your flash memory is ReadyBoost capable, and if so, you can directly choose to speed up your computer with ReadyBoost. The ReadyBoost settings dialog will open when you select this. Choose “Use this device” and choose how much space you want ReadyBoost to use. Click Ok, and Windows will setup ReadyBoost and start using it to speed up your computer. It will automatically use ReadyBoost whenever the card is connected to the computer. 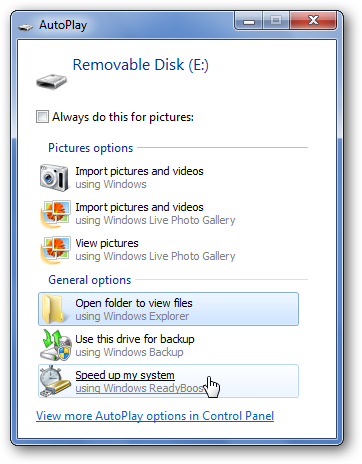 When you view your SD card or flash drive in Explorer, you will notice a ReadyBoost file the size you chose before. This will be deleted when you eject your card or flash drive. If you need to remove your drive to use elsewhere, simply eject as normal. Windows will inform you that the drive is currently being used. Make sure you have closed any programs or files you had open from the drive, and then press Continue to stop ReadyBoost and eject your drive. 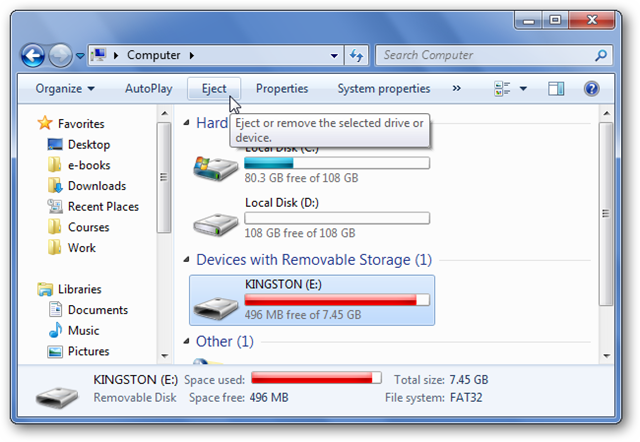 If you remove the drive without ejecting it, the ReadyBoost file may still remain on the drive. 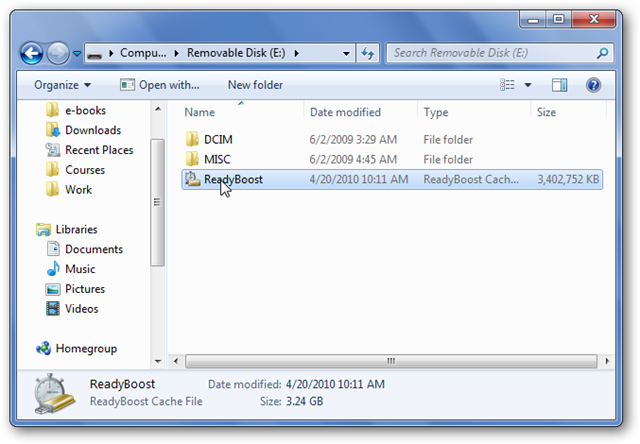 You can delete this to save space on the drive, and the cache will be recreated when you use ReadyBoost next time. Although ReadyBoost may not make your netbook feel like a Core i7 laptop with 6GB of RAM, it will still help performance and make multitasking even easier. Also, if you have, say, a memory stick and a flash drive, you can use both of them with ReadyBoost for the maximum benefit. We have even noticed better battery life when multitasking with ReadyBoost, as it lets you use your hard drive less. SD cards and thumb drives are relatively cheap today, and many of us have several already, so this is a great way to improve netbook performance cheaply.